A new long-acting contraceptive Patch designed to be self-administered by women. This may provide a new family planning option, particularly in developing nations where access to health care can be limited, a recent study suggests. 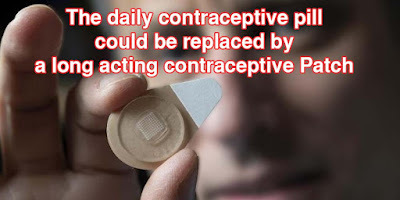 So the daily contraceptive pill could be replaced by a patch used just once a month. This patch injects contraceptive drug via microneedles and the effect lasts a month - originally developed for the painless administration of vaccines. After five seconds on a user's arm, the needles break away and remain under the surface of the skin to slowly release the drug then dissolve.